Inflating tires is one of the most basic and common uses for air compressors and is reason enough for every homeowner to own one. Whether for your car, bicycle, wheelbarrow, inflatable pool, or kids toys, most compressors will make quick work of the task. Sure, you can get one of those $30 tire inflators that plug into the cigarette lighter in your car, but expect to take about 5 minutes at each tire. And that’s really the only thing it’s good for. 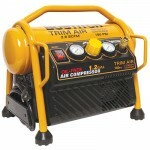 With even a cheap portable air compressor, all it takes is a few seconds and you can move it around anywhere you like. 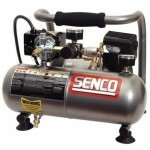 Just think about the amount of times you’ve had to spend a couple dollars at the gas station using their compressor. You probably would have saved money by buying one of these from the getgo. 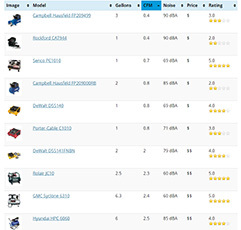 When doing research, this little unit shows up on quite a few “top rated” lists. What sets it apart from most is its low weight to high airflow ratio combined with a price everybody can afford. Because it’s only 24 pounds, there’s no hassle in taking out of the garage, carrying it wherever you want, plugging it in to the nearest outlet, and start inflating stuff. As the most powerful of these three choices (2.8 CFM at 90 PSI), the Bostitch is great for SUV and truck tires, large inflatable pools, and even farm equipment. It also handles smaller things as well. The only real downside to the CAP1512-OF is that it runs a bit louder than the less powerful units below. If you want something quieter, the Senco PC1010 fits the bill perfectly. As already mentioned in the full review of this model, noise is rated at a low 69 dBA making it whisper quiet when it comes to compressors. At 20 pounds, it’s even lighter to carry around but it has about a third of the airflow as the Bostitch. For filling up tires or other inflatable objects, it has plenty of power to get the job done. Recovery time is slow but unless you’re filling up a monster truck tire, it’s not really an issue. Like the Bostitch, the DeWalt D55140 also comes in at 24 pounds. 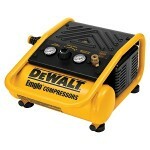 Like the Senco, the DeWalt also puts out 0.8 CFM at 90 PSI and registers only 69 dBA in the noise category. Many people actually prefer this model over the others because of its design. At only 9 inches tall, you can store it practically anywhere, including your car’s trunk. This is another example of a unit that would be great for filling up tires. Many people also swear by DeWalt tools instead of swearing AT some other lesser known brands.